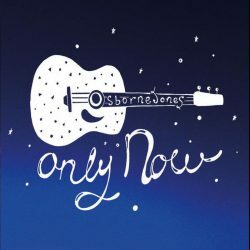 UK born and raised, Osborne Jones’ latest album “Only Now” is produced by esteemed West Coast (America) singer-songwriter musician Rich Shea (Dave Alvin etc). Recorded and engineered by Mark Linett at Your Place or Mine Studio in Glendale California, the quality of music from David-Gwyn Jones (lead vocals) and David Osborne (electric guitar) strikes a new high for them. Accomplished songwriting is supplemented with a top set of players; for not only do they benefit from the playing of seasoned act Shea (acoustic, electric, pedal steel guitar, mandolin), but stellar efforts by David Jackson (bass, piano, organ, accordion), Jim Shirley (fiddle), John Palmer, Shawn Nourse (drums) and beautiful harmony vocals (Cindy Wasserman, Gia Ciambotti) plus guest slots by Pete Anderson on electric guitar (You Used To Be) and Jerry Donahue on electric guitar (The Bond) as icing on the cake. Apart from the accomplished work of the players you have the wonderful, lived life vocals of Jones, who in turn has the pleasure of singing ten well-penned songs by Osborne and himself. The life-long friends though living on opposite sides of the Atlantic have kept in touch since childhood days in the Midlands (UK), and with them followers of a diverse set of country influences the sky is the limit. Ranging from America’s West Coast sounds of Gram Parsons, Merle Haggard and the likes of a little Tex-Mex (You Used To) plus Dwight Yoakam and the like Osborne Jones add a few tasty mixers to their staple drink. Osborne Jones impress through their genuine love of the honky tonk style of country, their stories of heartache, barrooms and philosophy of lost love and all that goes with it. Among their finest efforts you have pedal steel doused Heartstrings And Six Strings, and with them paying tribute in song to George Jones I Think She Still Cares. Beautifully executed with it draped in yet more exquisite pedal steel, fiddle, piano plus harmony vocals it instantly grabs the listener’s attention. Not for the first time Rick Shea’s production is stunning. Bricks And Mortar has Nigel Osborne lend a hand on the songwriting front; like with a handful more it warms the heart the listener in tasteful fashion without necessarily knocking them sideways on first listen. But such is the warmth of the players and vocals there is a feel good ambiance created; you can’t help but tap your feet, and walk away with a skip in your step. As with the excellent Never Crossed Mind, while on the other side of the coin they do know how to dig in emotionally. As heard on heartfelt ballads With A Heavy Heart, The Bond and title-track Only Now and with an extra great spring in their step On Any Given Day has his head left in a spin as he tries to figure out the other’s moods and motives. File under well-rounded country, music you can go back to and find something additional to enjoy every time. Like with Bricks And Mortar, because when it comes to sleepers this one meets all requirements, plus a good few more. West Coast country sounds embraced with additional deeper tones.